This is a listing for cute green & white flower mini pincushion made with reclaimed cotton fabric, made in 6 points patchwork pattern. I added some embroidery around the pincushion and formed a flower, shaping each petal with the cotton floss. I added a lime green button to add a finishing touch. The top of the pincushion has different fabrics as for the underside is of one complete fabric piece. But you can use this pincushion both sides if you wish. It is small enough to carry around anywhere you want. It's also a decorative piece so you can add it to your collection. 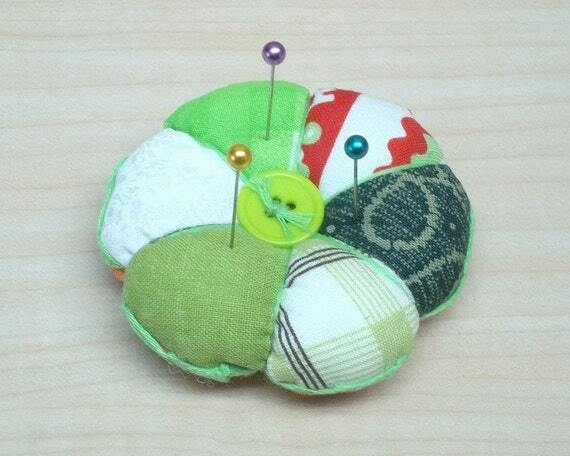 This pincushion measures 2 1/2" across X 1" thick. Thanks you for stopping by my shop.